An element of extraordinary importance that leads to great line speed is what is defined as “the axis”. 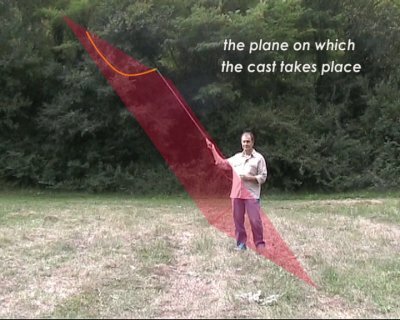 The axis is when in both your forward cast as in your backward cast, the line follows the same trajectory as the rod tip and not considering the plane in which the cast takes place. When casting with a light line, which is usually a 3 weight double taper and our cast is not aligned to the axis, we will have what is called a ragged line which is just an opening of the line outwards with a consequent loss in tension and this influences the line speed negatively and also the precision, the way the fly lands and the presentation to the fish. A sign that can help if we have nobody looking on as we practice is the internal part of the reel. When practicing, to see if your cast is aligned to the axis, just observe your reel; if it is not aligned to the axis it will rotate thus causing a small but important semicircular rotation. Let us not forget that the rotations of the reel, however small and insignificant, become large after two and half or more meters towards the rod tip and so the line become more ragged. 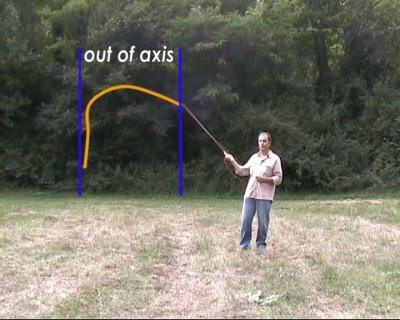 A good method to correct a non- aligned or out of axis cast is to stand next to a smooth wall and to simulate the casting movements without a rod. The moment your hand leaves the wall surface is when a non- aligned or out of axis cast would be generated. We can correct this movement. The moment your hand leaves the wall, you can compensate by pushing your hand outwards. There is also a forward non- aligned or out of axis cast. This is in fact more of a movement towards the inside by the rod hand rather than a true rotation and this causes your fly to go in the wrong direction. This is quite easy to correct because it is visible to the caster who is in direct control. Someone who has mustered the cast well but that has problems with alignment can easily get the right tension back again, just by waiting an extra moment. The line, however fast it is travelling will go back onto the axis. The cast can be recovered and the forward cast can take place.